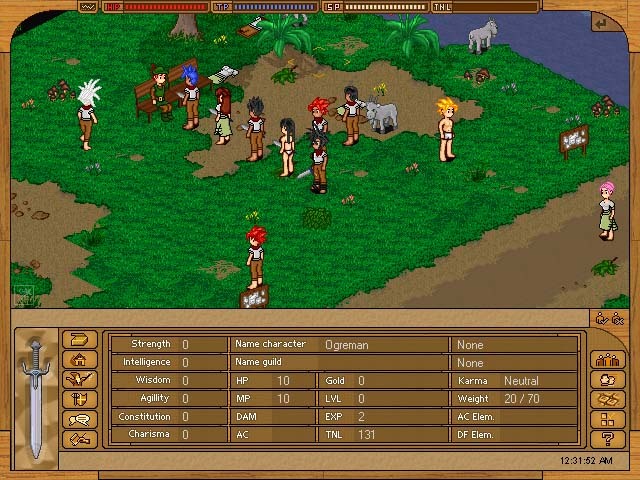 Endless Online is a 2D fantasy MMORPG with anime graphics. This game is somewhat in the mold of RuneScape, but has more colorful graphics due to the anime and a substantially smaller player base. Some of GameOgre's Review Directory members enjoy the game, but have penalized it for server problems. Keep in mind that although this game is playable, Endless online is still in Alpha. When you start the game, the first thing that you will need to do is grab some clothes or your little anime character will be running around in its underwear. 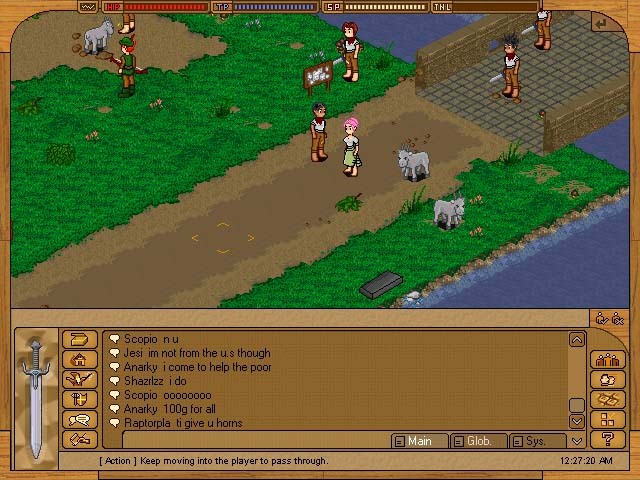 As can be seen in the screenshot above, one player had others line up to get free gold. Movement is very limited so standing in a line like that is quite easy. All in all, this is mainly a game for people who want a MMORPG that is free and does not require a huge download. In fact, the entire game client is currently under 10MB. Comment: Really good game. The best MMORPG that I have ever played. The only bad thing sometimes is that it is real hard to log in. However, most of the time it is not too hard. You should download it and try it out. Comment: This game needs major improvement. Endless Online has bad graphics, terrible gameplay and no storyline! Thus, no good or evil! This game needs to get into the 21st Century before it loses players. The only game that I hate more than this is RuneScape. Comment: It is ok. The graphics are a little out there and no sound. However, it is a great game to meet people. Killing things is fun too. Comment: The only thing that I really hate is the login time. It takes forever to login, but besides that it is a great game. It is really fun to trade and to get different equipment. Endless Online is completely free to play since it is still in Alpha.